The Cliffside living room furniture collection creates a decorative furniture look with traditional styled pieces that rarely go out of style. Comprised of a sofa, sectional components and chair, this classic collection features t-styled seat cushions with wooden bun feet and thick-rolled arms. 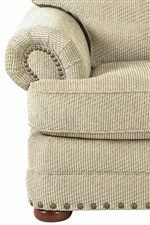 Welt cord trim and nail head accents create a tailored look from luxurious furniture styles, completing each piece with a stylish design. Browse other items in the Cliffside collection from AHFA in the area.